Integrative Multimodality Methods for Studying Brain Function is a 2-day workshop being held at Johns Hopkins School of Medicine for investigators with an interest in applying integrative modeling of data from modern anatomical and physiological methods to the study of brain function. It is a satellite event of the 2017 Society for Neuroscience Meeting in Washington, DC. While recent advances in structural and functional neuroimaging have made collection of multimodal data practical, processing tools efficiently integrating results across modalities have been slower to appear. This workshop will bring together basic and clinical neuroscientists to demonstrate integrative image analysis methods, covering practical aspects of processing and integrating data, including (1) structural MRI, (2) task-related fMRI, (3) resting-state fMRI, (4) DTI, and (5) ASL. Particular emphasis will be given to practical issues associated with processing data collected these different MRI modalities, and then integrating the features resulting from the different pipelines. Processing pipeline examples will be drawn from Mricloud, SPM, CAT12, CONN Toolbox, AFNI and FSL. On the second day of the workshop, Neuroconductor, a new framework integrating processing pipelines from all these programs using the R software environment will be introduced with practical examples. Current issues related to inference and critical thresholding arising in all MRI modalities will be discussed at the end of the workshop. Examples from clinical research will include application of these methods to neurodegenerative disorders (primary progressive aphasia), stroke recovery and cognitive manifestations of HIV infection. Directions to the classroom can be found here. Register for the workshop here. Registration at the main SfN meeting in Washington is not required to attend this workshop. There is no charge for registration, but space is limited, so pre-registration is required. The workshop is sponsored by the Johns Hopkins Center for Brain Imaging Science. The workshop organizers are Andreia Faria, MD and Thomas Zeffiro MD, PhD. Refreshments and lunch will be provided by NIRX. A hotel map can be found here. 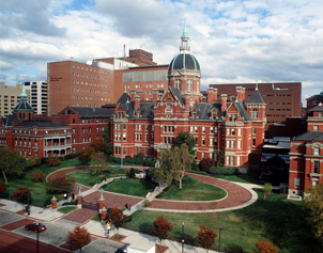 From the The Admiral Fell Inn and nearby by Baltimore hotels: The Admiral Fell Inn provides a free courtesy shuttle to Johns Hopkins' main medical campus (location of the workshop), starting at 6 a.m. In addition, a free, city-operated East Side Shuttle runs between Fells Point, Harbor East, and the medical school campus. The East Side Shuttle route map and schedule can be found here: http://www.charmcitycirculator.com/content/east-side-shuttle.